Red maple is a small to medium tree with a long, clear trunk and a narrow, irregular crown. Leaves are opposite, simple, 2–5 inches long, with 3 or 5 lobes; middle lobe is longer than side lobes; base of lobes is V-shaped; lower surface whitish, margins toothed. Bark is light gray and smooth at first, becoming darker, furrowed, and flaky on older trees. Twigs are slender, smooth, reddish, and shiny, with pale pores; bud tip is blunt. Flowering: March–April; red, with 4–5 small petals. Fruits are red, in winged pairs, appearing May–June. Varieties: Drummond's red maple (Acer rubrum var. drummondii) has the lower surface of leaves densely hairy and whitish; it lives mainly in bottomland forests in the Bootheel and along sinkhole ponds in the southeastern Ozarks. Also, there are many horticultural varieties and crosses of red maple found in nurseries and in planted landscapes; most were developed for brilliant fall color. Red maple turns color in fall at Peck Ranch Conservation Area near Winona, MO. Occurs naturally in bottomland forests, edges of streams, swamps and sinkhole ponds, moist to dry upland forests, and along bluffs. Drummond's red maple, of southeastern Missouri, prefers the wetter locations, while Acer rubrum var. rubrum is most common in the Ozark uplands. Easy to transplant and tolerant of many soil conditions, red maple is a favorite of landscapers. 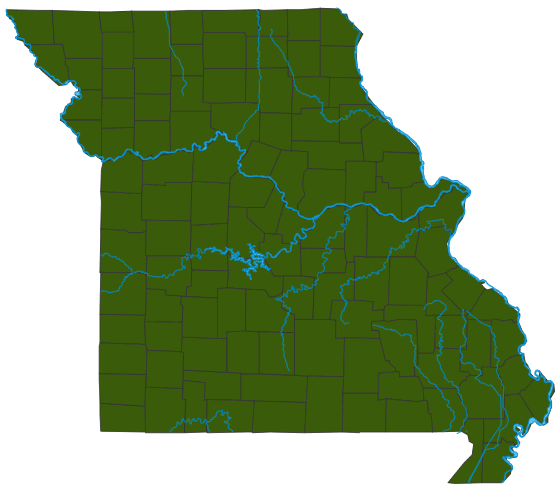 Scattered to common in the Ozark, Ozark Border, and Mississippi Lowlands natural divisions; cultivated statewide. Red maple is most often planted for its spectacular orange and red fall color and is a mainstay in the nursery trade. Because it beautifies countrysides and cityscapes, its presence helps tourism. Cultivated since 1656, red maple is also used a great deal for its wood. Birds and rodents eat the seeds. Trees provide homes for many animals: insects live upon their leaves, birds build nests in their boughs, snakes hide and bees nest in their hollow limbs, and spiders and other insects live on the bark. After trees fall, other animals move in.